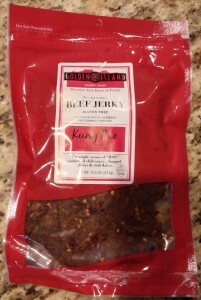 Today we’re tearing into of a bag of Golden Island All-Natural Kung Pao Beef Jerky procured at the local Costco. Taste (B+): Hot is subjective, but this one will probably tick the box for most folks. There’s a flavor race when you take your first bite with a rush of sweetness flanked on all sides but a tongue-flailing spicy kick. The baseline taste seems more that of a traditional “Asian” flavoring through the pairing of a simple sugary soy sauce combination with some additional savory spices through in to great effect. Riding atop that flavor is a double-punch of hotness. They used chili sauce, chili powder, a bit of turmeric and some paprika to give this jerky a decided kick, and it does the job nicely. It’s a really enjoyable burn. Not overwhelming by any means, but definitely something that grabs your attention and lingers for a while on your palate. Still, these two flavor profiles don’t really play together – the effect is like eating two different jerkys at the same time. The complement each other well enough but they are persistently distinct from beginning to end. Texture (A): This jerky is tender and moist and tears easily. While cut along the grain, the pieces’ have a slightly rough, almost ragged looking surface that feels a bit fluffy, for lack of a better word, as you take your bite. It is, initially, a bit unfamiliar but the effect is a pleasant one and you quickly acclimate to it. In practice it almost seems a clever way to up the surface area of the jerky so it can accommodate more flavor. Smell (B+): The first thing you smell is a sweet and soy scent that is really quite appetizing. With a few more whiffs you start to make out a bit of the tang from the chili flakes / pepper / powder. It’s a distinctly Asian-style scent that nicely foretells of the great flavor that follows. Appearance (A): The pieces are generally medium to largish in size, easily providing a few or more healthy bites each, and are a dark brown color with inviting red hues throughout. It also sports a substantial coating of visible red pepper and other spicy bits, a warning sign of the heat it brings to your mouth. All together it has a distinct appearance that is both attention-getting and appetizing. Consistency (B+): This jerky has been made with a clear attention to the execution of flavor. Each bite, big or small, brings the same sweet and savory flavor with an escalating heat. The moisture level, too, is consistent throughout, demonstrating great control in the jerky making process. The one area where this jerky falls a bit short is in the meat itself. While the meat definitely seems to be of good quality, there were too many pieces with inedible bits of gristle. While it would generally not be that noteworthy to have one or two bites with these unappetizing inclusions in a bag of this size, there were numerous pieces compromised in this way. Some of the gristle was small and easily discarded while other pieces were large and invasive enough to abandon the bite or the large piece altogether. This is by no means enough of a distraction to dull the joy of this jerky but it does diminish its otherwise excellent execution. Overall Impression (B+): This is a great jerky! It’s tasty, fun, and delivers a really compelling kick in the tongue with a spicy heat that’s full on flavor rather than gratuitous pain. 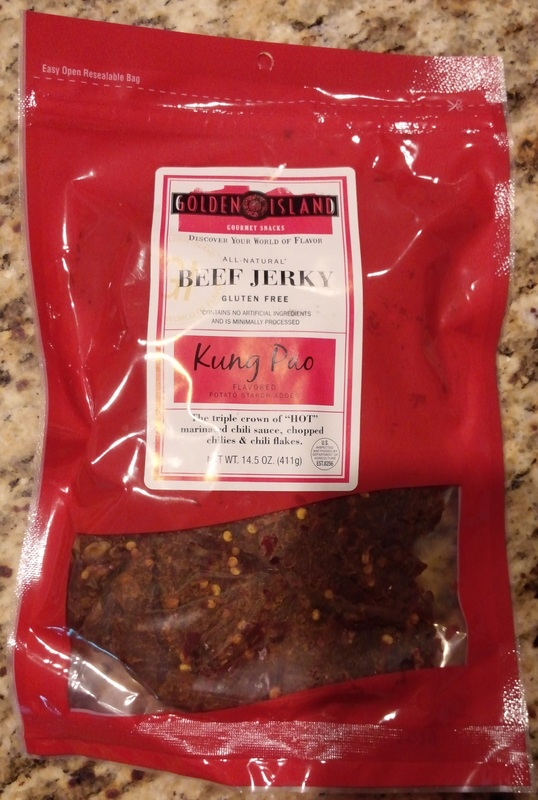 The Golden Island folks truly do make great jerky and their Kung Pao Beef Jerky is a great example of their skill. If you enjoy sweet and savory heat then this jerky will likely find a happy place in your world. Pick up a bag and give it a whirl, but don’t forget to keep that beverage handy. Eat well! Tagged artisan, beef, gourmet, pepper, spicy. Bookmark the permalink.